Foredom Carbide Miniature Cross Cut Tree Radius 3/32 inch Dia. 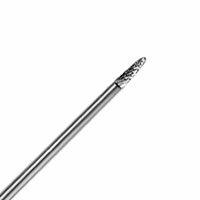 1/4 inch Long 2.35 mm Shank 1 1/2 Inches Overall Length Style A-TR-5C. Miniature Carbide is ideal for use on hard wood and most metals including stainless steel steel alloys cast iron etc. 100000 RPM Max Speed. Made in USA.